Portsmouth, New Hampshire--(June 2011)--"For many, the image of an inviting pool is the epitome of a relaxing vacation, but pretty pools can sometimes appear rather pedestrian," says Mike Thiel, Founder and President of Hideaways International, Inc. (www.Hideaways.com). "So, what's the twist to our list? Instead of presenting a predictable selection of pools that overlook beautiful beaches, we at Hideaways challenged ourselves to find modern swimming holes that delight with unexpected experiences that make a big splash." #1 (Top Land-Locked Pool): Llao Llao Hotel & Resort, Golf-Spa, Patagonia, Argentina. Some say traveling to Patagonia is a trip to the end of the world, but here, floating in an elegant indoor/outdoor heated pool—with its goose-bump views of two glacial lakes and three Andean mountains—you get the feeling this is where the world actually begins. 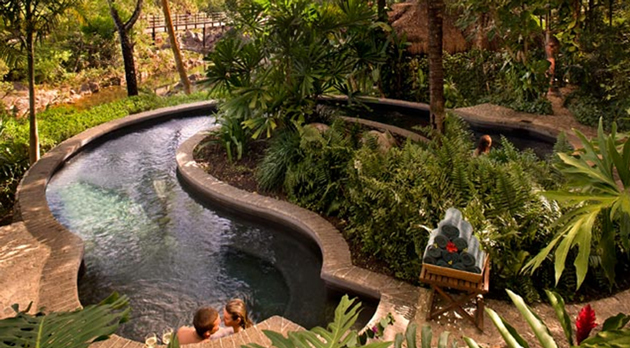 #2 (Top Spa Pool): Blancaneaux Lodge, Cayo District, Belize (pictured). Every ounce of stress just melted away thanks to a masterful massage; you didn't think it could get any better, but now you find yourself in a soothing hot pool—heated solely by hydro-electricity—that overlooks cascading jungle waterfalls and fills you with an overwhelming sense of calm. #3 (Top Pool Pavilion): The Sarojin, Khao Lak, Thailand. A warm breeze tickles your skin and there's a smile on your face, only no one can see it, which is part of the pleasure, of course, as you're happily ensconced in one of the Sarojin's private pool-island pavilions that seem to float in the water—talk about an oasis within an oasis! #4 (Top Outdoor City Pool): Hotel Majestic, Barcelona, Spain. After a deliciously exhausting day shopping in Barcelona, you find refuge not up in your hotel room but up in your hotel's rooftop pool, where a strikingly colorful cubist mural by Philip Stanton crowns the space, energizing your swim and your soul. #5 (Top Indoor City Pool): The Observatory, Sydney, Australia. You slip into the warm water and close your eyes as you lean back and begin to float. Then you open your eyes and find yourself gazing up at the twinkling constellations overhead, a fiber-optic recreation of the southern-hemisphere sky. Even Galileo would be star-struck. #6 (Top Cruise Pool): Celebrity Cruises, Solstice-class ships. It's late, and you and that special someone want some grown-up time, so you choose the adults-only Solarium pool. This indoor lap pool has its own dancing fountain with changing colors that turn it into a magical light show at night, so you'll feel both relaxed and energized at the same time. #7 (Top Dolce-View Pool): L'Andana, Tuscany, Italy. You're in Tuscany, and you want to experience this beloved region in every way you can, in every bite, in every sip, and in every scent. As you sink into the cooling embrace of L'Andana's pool, you realize you also can experience Tuscany in every view, for this pool looks out over an ancient Italian village. #8 (Top Number of Gorgeous Pools): Blue Palace Resort & Spa, Crete, Greece. You have your own seductive pool, as mesmerizingly blue as the sky above and the sea just beyond. You don't want to leave. So don't. And don't worry about getting bored! With 147 pools, you could stay here for five months and swim in a different pool every day. "A pool with a view is great," says Mike. "But a pool with a view and a twist is certainly an experience worth traveling for."